Less than a mile north of Hinesburg village on Shelburne Falls Road is one of Vermont's best spots for finding elusive Golden-winged and Blue-winged Warblers, Geprags Community Park. This small property, owned and managed by the town of Hinesburg, contains several different habitats, including grassland, early succession/shrubland, and mature forest.This is the preferred habitat for breeding winged warblers. Vermont is the only state in New England that supports breeding Golden-winged Warblers and Geprags Park is prime nesting territory for them. For the past several years former GMAS Board member, Bill Mercia, has led a field trip in May looking for these warblers, which have been successful in finding these and many other birds. Furthermore, Audubon Vermont's Mark LaBarr has assisted the town in managing this property for birds. Recently, Mark advised the Conservation Commission and the Selectboard during the construction phase of the natural gas pipeline that runs through Geprags. In 2017 a new species was added to the list of breeding birds in Geprags Park-Hooded Warbler. Whether Hooded Warblers will become regular breeders at Geprags remains to be seen, but we are hopeful. Regardless, Geprags Park hosts a variety of nesting warblers as well as many other birds in migration. American Redstarts, Yellow Warblers, Chestnut-sided Warblers, Common Yellowthroats, Ovenbirds, and Black-and-White Warblers all nest in the park and are relatively common. In migration many other warblers pass through the park. In addition Red-eyed Vireos, Rose-beasted Grosbeaks, Brown Thrashers, Eastern Towhees, Indigo Buntings, and Baltimore Orioles are common in the park and a variety of flycatchers, woodpeckers, and grassland birds, including Bobolinks, Savannah Sparrows, and Eastern Meadowlarks have been reported there. In fact, VT eBird lists an astonishing 150 species that have been identified at Geprags Park, including 17 warbler species. A link to a useful bird list and annotated trail map compiled by Audubon Vermont found below lists many of the common birds to be discovered at Geprags Park. 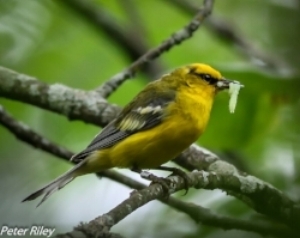 Another excellent birding hotspot in Hinesburg is the Hinesburg Town Forest. This sprawling property of more than 800 acres is a popular destination for bikers, hikers, and dog walkers as well as birders. In contrast to Geprags Park the Hinesburg Town Forest is composed mainly of mature hardwood forest and conifers. One exception is an open area that has been previously logged near the Economou Road entrance. This area consists of early successional shrubland that is perfect habitat for nesting Mourning Warblers. In the conifers breeding Blackburnian Warblers are fairly common. In the hardwood forest Wood Thrushes and Hermit Thrushes can be heard and sometimes seen. Olive-sided Flycatchers, an uncommon bird in Vermont, have been reported perched on snags in the eastern section of the forest. Among the woodpeckers Yellow-bellied Sapsuckers are regulars. In the shrubland area Ruffed Grouse are often seen. Overall VT eBird lists over 100 bird species that have been reported at this hotspot, which is remarkable given that the Hinesburg town Forest is not heavily visited by birders. There are three points of access to the Hinesburg Town Forest-Hayden Hill East, Hayden Hill West, and Economou Road. For the latter, follow Economou Road to the end , then continue slowly on the old logging road to a small parking lot, kiosk, and an orange gate. The links below provide directions to Geprags Park and the Hinesburg Town Forest as well as a list of birds that can be seen at each spot.